Cube CRM web application is designed to further energies the organization’s efforts to efficiently organize and maintain information that is crucial to many aspects of the business. Cube CRM enables organizations to do business in a better manner. There are various modules such as account management, user management, product management, complaint management, lead management, opportunity management, employee management in this web application. The main motive of Cube CRM application is to improve services provided directly to customers and to use the information in the system for targeted marketing and sales process. Android version of Cube CRM application is used to provide all the feature of exiting CRM in offline mode. Android App version of Cube CRM is also used for tracking of filed engineers, sales team and Geo fencing. 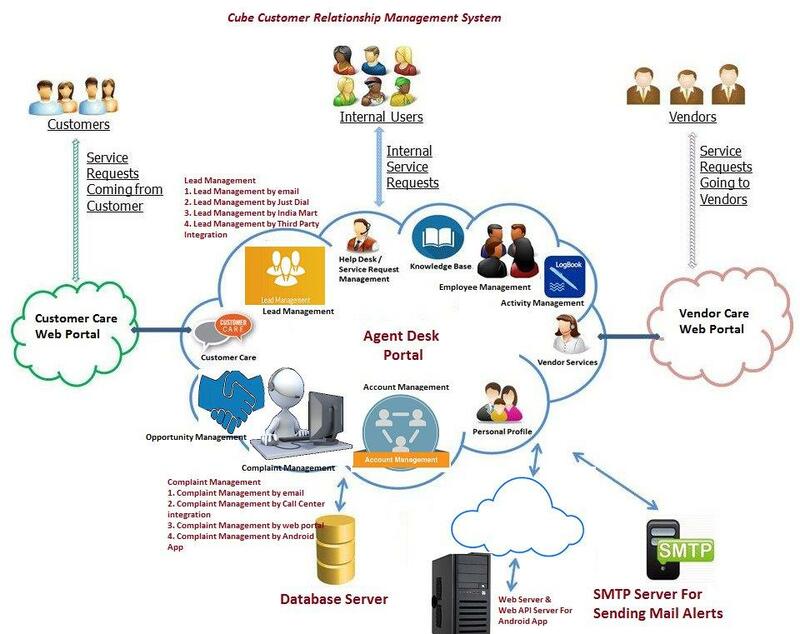 Access of Cube CRM application is authentication based and hierarchy based application. Each user of this application comes in hierarchy model and he need to pass authentication process to use both version of application. Account Management – This module of application is used for creation of new account, modification of an exiting account. One can also create or modify contact of various accounts by using this module of application. User Management – This module of application is used for creation of new users, modification of an exiting user. Each user is associated with predefined rule. Each user have access of various modules of CRM on the basis of rule definition. Each user is associated with hierarchy. Complaint Management – This module of application is used for complaint management. Organization can improve the service provided to customers by using this module. Complaint can be registered by using various modes such as by phone call, by email, by SMS and by Fax. An unique complaint number is generated for each call and each complaint can be track at any stage by using web portal or Android App or from IVR. Email and SMS notification has been implemented at various stages of complaint. Product Management – By using module of application user can create a new product or modify an exiting product. Each customer is associated with one or multiple product. Customer can registered his/her complaint only for registered products. Activity Management – By using this module employee of organization can enter his/her daily activity details. Monthly performance report can be generated by using module of application. There is a provision for each HOD of department to enter his/her remark again each employee. Lead Management – Lead management of this application is used for lead creation, adding remark and status in existing lead. An unique is is generated for each lead. Each lead can be track at any stage. System will automatically remind for next follow up date to assigned users. Lead can be generated by various modes such as by web portal, by email, by third party lead providers such as just dial, India mart etc. Opportunity Management - Opportunities management is similar to lead management. There is a provision to convert lead into opportunity. There are various stages for opportunity in the system. System stored all history associated with each opportunities. Issue Management – This module of application will be used to registration of issue, adding remarks in existing issues. Any user of can registered any issue for any department and department will assign that issue for resolution in his/her team. Once issue will be resolved then automatically system will send a notification to user. AMC Management - This module of web application will have provision to entered AMC details of various customers. This module is also associated with complaint management module. If AMC is registered for customers or warranty is available for any customer then details will be shown in complaint module. There is a provision to associate various documents to each AMC. Location Tracking – Android app is used for tacking of location. System will store location detail of each Android App users on periodic basis and same can be generated by using MIS module. EIS – Employee information system is used for management of employees. By using this module each user can register new employee, modify existing employee. By using this module user can apply for leave, add loan request, add his/her reimbursement details and advance request. Sale Order Processing – This module of Cube CRM application is used for order booking, order tracking. This module is also used for various level of approvals for sale order such HOD approval, commercial approval and technical approval. Each order is associated with a sale order number and one can track any order at any stage from creation to execution of the order. MIS – This module is used to generate various MIS. There are various filters and advance filters are available in application to generate various MIS. One can generate complaint summary and detailed list, status wise complaint, product wise complaint list, lead summary and detail, status wise lead list and many more for other modules also.